Choose a sunny place to plant. Be sure that there will be enough room for the number of trees you plan to plant and enough additional room to do transplanting if you want to add to the Nursery. 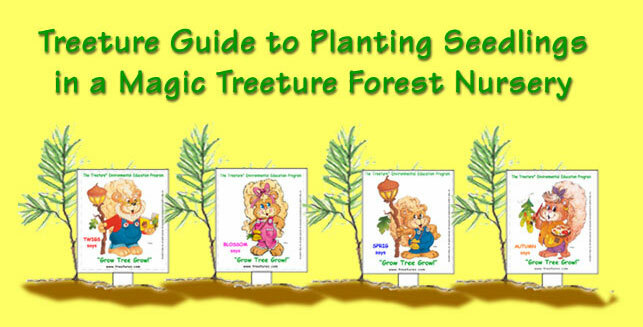 (Check the information from Treeture Guide to Plant a Tree and Treeture Guide to Plant a Seedling). The kind of trees you plant will help determine how much space you will need between seedlings and between rows. This is where a professional partner can be of help. If you plan to hand weed, you will need less space than if you plant to use mechanical equipment. Before your seedlings are planted, the beds should be prepared. Any growth, like weeds or other vegetation that would compete with your trees, should be removed from the planting area. The holes that you dig should be deep enough to fit the entire root system of the seedling from beginning to end, vertically. From the day your seedlings arrive, do not wait any longer than 3 to 4 days to plant them. Before planting, store the seedlings in a shady, moist, and cool place- about 36 degrees F. Never let the roots dry out before planting. A 45-minute soaking just before planting would be good for the seedlings. When the hole is ready to receive the seedling toss in some soil and add water to help remove air pockets. The root collar of the seedling should be planted one inch below ground level. The roots should be covered with soil and the soil pressed down around the roots so that there are no air pockets. The hole should be filled to ground level. Then the seedlings should be watered well. If the water makes the soil settle, add more soil. Keep the area around the seedling at ground level. Place your Treeture Tree Keeper markers next to each seedling. During the first year of planting, do not fertilize the seedlings. When it is time to fertilize, check with a local nursery to find out what part of the year is best to fertilize in your region. for your school or group. To prevent weeds, you can use landscape fabric cut in a circle around the seedlings. Then cover the fabric with no more than 1 inch of mulch or wood chips. Remember to water seedlings in dry weather! Twice a year, root pruning is suggested. Mark a circle around each seedling. The diameter of the circle will depend on the tree size and spacing of the rows. Using a flat spade, dig into the ground down 8-10 inches around the perimeter of the circle. You can transplant a 2 to 3 foot seedling to another location, within the nursery, once it has outgrown its space. You will need to keep the roots and the soil around it together. Begin digging outside the root pruning circle. The "root ball" can be moved a short distance within the nursery using burlap or any fabric to contain it. Prepare the space and lower the small root ball into the hole an inch below ground level. Fill in the earth around it, pack down the soil, and add some water and additional soil to bring it to ground level. When each tree is the height you have chosen for transplanting, it can be moved to "home sweet home." The best time for transplanting depends on your geographical location. Example: If you live in the northeastern part of the United States, transplant in the late fall or early spring before the tree has begun to bud. For a long distance move, the root ball should be wrapped in burlap and tied together. Before traveling a long distance to the trees permanent home, the root ball should be covered with water. As an elementary school project, the moving of a larger tree will need the help of adults or teenagers along with a program partner with tree care experience. To remove the tree from the nursery, you dig a trench around the outside perimeter of the root-pruning circle. As the trench becomes deeper, it should be angled towards the center of the circle. You will be making a large root ball that will hold the root system and the soil around it. The entire root ball should be placed on burlap, wrapped and tied and watered. to your tree in its future home! and Michael Marks from Almstead Tree Company for all their help!